Office Hours: Weekdays 8:00 A.M. - 4:30 P.M.
Chief Academic Advisor Quiana Jackson M.S.Ed. is a native of Southern Illinois, and is a two time graduate of SIUC with a Bachelor of Science in Management and Master of Education in Workforce Education and Development. She has experience in college preparation, staffing, career and employment counseling and academic advisement. She earned the New Advisor Award in 2014 at SIUC and continues to strive for excellence in advisement. She enjoys working with students in achieving their goals. She loves reading, movies and spending time with family. Ed.D. Northern Illinois University, 2004. A two time graduate of Southern Illinois University Carbondale with a Bachelor of Science in Education with a major in Recreation and a Master of Science in Education with a major in Workforce Education and Development. He is currently pursuing his doctoral degree in Education Administration and Higher Education at SIU. Walter worked as a graduate assistant at SIU with Center for Academic Success, assisting with freshmen and undeclared student in addition to working with Student Rights and Responsibilities helping freshmen students understand the Student Conduct Code and the consequences of breaking that code. While working as an Academic Advisor in Center for Academic Success and University College he taught the UCOL 101A Foundations of Inquiry Freshman Academic Success Seminar Course. Walter stays motivated due to seven and half years of academic advising experience, working with departments across campus, and by presenting at leadership conferences. He has participated in educational career events and job/internship fairs. He has conducted an Exploratory Student Advisement Student Panel to highlight former freshman students who are now highly successful sophomores, juniors, seniors, graduate students and employees in the workforce. Walter is active on campus as he serves on several committees and works with campus RSO’s, Fraternities, Sororities, and the SIU Collegiate Chapter of the NAACP. He enjoys spending his free time exercising at the SIU Recreational Center, spending time with family and friends, reading, watching sports and movies. Christopher is a two time graduate of Southeast Missouri State University with a Bachelor of Science in Education with a major in Social Studies as well as a Master of Arts in Educational Technology. At Southeast he worked as a graduate assistant with New Student Programs, assisting with freshmen and transfer student orientations in addition to helping coordinate freshmen move in day, the Welcome Back Picnic, and opening week activities. Christopher worked as a coordinator in Career Services establishing the career proficiency courses each semester and again helped at orientations, advising students and helping them set up their first class schedule. He worked with departments across campus and the Cape Girardeau Chamber of Commerce to put on several educational career events and job/internship fairs. Most recently you may have seen Christopher at Best Buy selling cell phones and talking up a storm with anyone and everyone. He enjoys spending his free time with friends and family, reading, watching sports (go soccer!) and movies, or going for a jog on a nice day. Christopher can’t wait to start this newest chapter in his life! Melanye is formerly from Southern Illinois University Edwardsville where she was an Admissions/Records Officer in the Office of the Registrar. While working at SIUE she advised students and evaluated their records for commencement eligibility. As a graduate student at Southern Illinois University Carbondale, she worked in academic advisement in the School of Architecture. Melanye holds Master of Arts degrees in Legal Studies and TESOL (Teaching English to Speakers of Other Languages) from SIU, as well as a Master’s Certificate in Dispute Resolution. Victoria is a two time graduate of Southern Illinois University Carbondale, with a Bachelors of Arts Degree in Mass Communications, as well as a Master’s of Science in Education with an emphasis on Workforce Education and Development. Originally from Southern Illinois, Victoria has spent the last 9 years working in higher education at Kaskaskia College in Centralia, Illinois. During her time at Kaskaskia College, she worked with various Career and Technical programs as the Perkins department coordinator, and also advised students who were seeking their associate degrees. 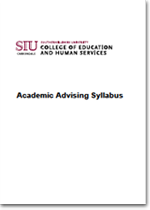 Her goal as an academic advisor at SIUC is to form relationships with each student and to make the transition as seamless as possible. Jaqui comes from Northern Ireland where she worked as a legal secretary for several years before moving to Chicago almost 12 years ago. She now supervises and schedules the student workers in the advisement office and provides project coordination and administrative support to the advisors.